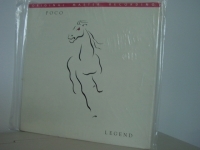 "Poco, Legend - "MFSL Factory Sealed - JVC Super Viny- LAST COPYl"
POCO - LEGEND - MFSL SEALED LP - This is a MFSL Super Virgin Vinyl (so pure that you can see through it if held up to the light) JVC Half-Speed Japanese Pressing. THIS IS OUR LAST COPY FOREVER. This is one of those albums that's fallen between the cracks of time. Virtually every song here is worth a listen. Crazy Love, In the Heart of the Night, Legend are classics. I can't figure out why a lot of reviewers insist on comparing Poco with the Eagles. I know, they had similar country rock roots. But by the late 70s, the Eagles had formulated a harder-edged sound that had little in common with their first couple of albums. In fact, Legend has more in common with the early Eagle material than than with what the Eagles were doing in 1978, when Poco released this record. So check it out. It's good stuff. Track Listings 1. Boomerang 2. Spellbound 3. Barbados 4. Little Darlin' 5. Love Comes Love Goes 6. Heart of the Night 7. Crazy Love 8. Last Goodbye 9. Legend MFSL LIMITED EDITION. This Limited Edition FACTORY SEALED LP is an audiophile collectors item that simply gives the feeling of being directly in the studio with the artist. Used nothing but the finest lacquers. The more you play the LP, your stylus will polish the grooves and actually improve the sonics of your MFSL LP. This recording is mastered from the Original Session Tapes. This Out of Print LP has all Liner Notes, Photos, and Artwork from the Original LP faithfully recreated.